This gorgeous split level has been professionally done from top to bottom. 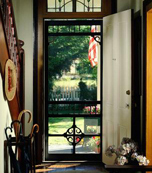 Inviting arched entry with beveled glass door, side lights and transom window. Ceramic tile foyer with winding oak staircase leads to wide open great room with soaring ceiling, four sided boxed windows and corner fireplace with mantle and arched alcove. Open kitchen with ceramic tile flooring, oak cabinetry with corner lazy susan, center island, all stainless steel Jenn Air and Kitchen Aid appliances. Separate eating area with bay door wall with boxed windows at top. Den with four sided bay window. Dining room with hardwood floors. First floor laundry room has access from the garage. First floor master suite with pan ceiling and luxurious private bath with ceramic tile and jetted tub that leads to a large walk in closet. Three additional upper level bedrooms and full bath with oak cabinetry and ceramic tile. Incredible professionally finished basement features a curved glass block wet bar, gas fireplace, an additional full bath with stand up shower and ceramic tile and an additional 5th bedroom, storage room and office! Oversized 2.5 car garage with 18 foot-wide/8 foot-high garage door also features a unique work station. Stamped concrete porch and walkways front to back with gorgeous landscape and patio in back. Home also features a generator hookup with water backup sump pump. Custom lighting, designer paint, professional artist hand paintings and drawings. Custom blinds and window treatments throughout. Custom ceiling fans in all bedroom and dining room. In-ground sprinklers, C/A and intercom system. Nothing to do here but move right in! MORE MODELS TO CHOOSE FROM - Call for Details! from Web Wizard Creations & Real Estate Network Cauley and Company. Any person(s) and/or companies that copy information and/or graphics from this web site without written permission will be subject to legal action.